A new exhibition about robots opens at the Science Museum this week. Andy Hill gets acquainted with ten that are already at large in our city. 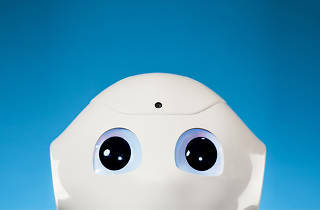 A disarmingly cute, programmable humanoid robot by the name of Pepper (above) is working as a companion for old folk in care homes who would otherwise be isolated or staring at a television all day. Some care homes employ Pepper in a simple meet-and-greet capacity, but the four-foot-tall bot – built in Japan and marketed in the UK by Robots of London – can also send dictated emails to grandkids, read the news, advise what’s on the menu that day and even help ensure that nana remembers to take her pills in a timely fashion. Pepper is also right now working in an estate agent’s office in London. 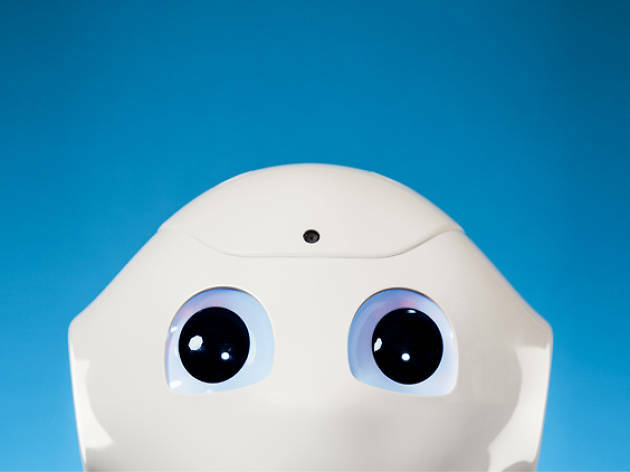 The doe-eyed robot has previously tackled jobs such as meeting and greeting delegates at conferences and manning reception desks, but her designers believe that her ability to instantly search the market and provide detailed up-to-the-minute info will make her near-ubiquitous in the property world before long. The exact location of the estate agent’s office where a robot is currently working is a secret, so we can all have fun guessing. Last September the Royal Navy took to the Thames to show off the latest addition to Her Majesty’s fleet – a drone boat. Officially christened the Maritime Autonomy Surface Testbed or MAST (see what they did there? ), the unmanned craft is constructed on a dystopian-sounding ‘Bladerunner’ hull and can hit speeds of around 60mph. So far it’s only intended for reconnaissance missions, but before long rest assured some salty tar will have whacked a bloody great cannon on it. The Princess Grace Hospital near Baker Street was the first in the UK to install the Da Vinci robotic surgery system. It gives medics the ability to perform complex, delicate procedures on kidneys, livers, prostates and more with minimal cutting, while providing superior enhanced imaging. So does that mean no more surgeons? Not quite. For now, Da Vinci still needs a dashing doctor at the console. But in the US, IBM’s Watson supercomputer is already proving itself better at diagnosis than human medics. So it shouldn’t be long before your much-abused liver can be fixed without recourse to an intimidatingly hot genius with bad handwriting. You’ll have heard the buzz around driverless vehicles. Uber is trialling a system in San Francisco that will mean the company can, as soon as the law allows, replace all its drivers. In London, a firm called Oxbotica has autonomous cars pootling about the Greenwich Peninsula, though none has yet braved rush hour on the South Circular. Actually, automatically controlled vehicles go way back in London – the Victoria line hasn’t technically needed operators in the cab since it opened nearly 50 years ago. Asmall firm in Islington called the Shadow Robot Company specialises in the development of realistic, five-fingered robot hands. The applications are countless – check out a video online of one making a coffee and playing the piano – but perhaps the most fascinating is in agriculture. For delicate tasks such as urban gardening and, in particular, fruit-picking, Shadow Robot has shown itself easily the equal of human labourers. Which, depending on your perspective, is excellent or horrifying. Makr Shakr is a wholly automated bartending system capable of fixing you a drink without the touch of a human hand. Using dextrous robotic arms, Makr Shakr whips up an array of professional-standard cocktails and gives creative soaks the opportunity to input their own concoctions via a nifty app. It’s already doing a roaring trade on the not-at-all-Bond-villain-sounding cruise liner Quantum of the Seas. And it dazzled London topers last year at New Scientist Live. The firm behind it is tight-lipped about the future, but we can hopefully expect it to return with bricks-and-mortar premises in the not-too-distant future. An ambitious Berkeley Square-based robotics firm is looking to change the way we cook. Its brainchild, Moley, consists of two robot arms and a camera installed in the kitchen to record all the steps taken when you – or, ideally, a professional chef – cook a meal. The movement data is stored or downloaded from an iTunes-style library, so the robotic limbs can replicate any recipe, at any time. So, from about 2018, you’ll be able to crack on with the serious business of getting sloshed while Metal Mickey whips up a note-perfect lobster bisque. A couple of years ago a savvy London teen spent the summer break between school and university writing a piece of software solely designed to dispute parking tickets on behalf of his friends and family. Hundreds of thousands of users, and many millions of pounds’ worth of overturned tickets later, DoNotPay is touted by its creator Joshua Browder as the world’s first ‘robot lawyer’. Its caseload has diversified into arguing the toss with belligerent airline lawyers and even handling landlord disputes. All for free! Last November a kebab shop in Greenwich made history by delivering the UK’s first takeaway meal by robot. The six-wheeled rover – built by the badass-sounding Starship Technologies for online delivery company Just Eat – collects your grub from the kitchen, sends a text when it’s at the front door and is able to cart around the equivalent of three full shopping bags in its metal fuselage over ten miles of pavement. It’s operating right now and will roll out across London later this year. Best thing of all? You needn’t feel bad for not tipping it. Even when it’s pouring down. London artist Giles Walker creates works that blur the line between robotics and sculpture. Check out a couple of his creations at the Science Museum’s new exhibition this month, including his stylish recreation of Eric, a pioneering British robot from 1928. In the past Walker has used his ‘kinetic sculptures’ to draw attention to the overlooked and disenfranchised by making robots that mimic a pair of bantering, parkbench drunks, and even a ‘homeless’ bot that ‘speaks’ with the voices of rough sleepers who Walker himself interviewed. Want to see more cool droids? ‘Robots’ at the Science Museum opens Wed Feb 8.